IN STOCK, NO PRE-ORDER WAITING PERIODS, WHICH ARE SUBJECT TO MANY DELAYS! YOUR ORDER WILL SHIP WITHIN 3 BUSINESS DAYS. Ships LTL freight, street, curbside delivery only. Please ensure a phone # is provided at checkout. Stainless Steel Frame, Guaranteed not to rust! Heater Pre-Installed, keeps the water hot without having to add more water! Size Drain Pipe (18" L Flexible line) - 1.5"
UL approval is sometimes required on new construction. If this is going into new construction, the inspector might require UL approval. Please check first before buying. If you are not a top-notch do-it-yourselfer with real plumbing and electrical skills please hire a professional plumber/electrician as you could seriously damage your tub. > $200 Shipping within the mainland United States with tracking # and insurance. (Tracking #'s emailed automatically) These ship with LTL freight carrier. They will call before they deliver. We will also provide a tracking # once this is shipped, so you can track its progress. *** Notes regarding freight delivery charges, on this and all other freight that we ship. The $200 delivered rate is for most areas within the USA mainland, NOT all areas. Areas in Florida Keys, Martha's Vineyard, etc will have higher transportation costs. Locations must be accessible by a semi truck. Hard to reach residential areas might also have an additional charge if a special truck is needed. If you feel there will be any trouble reaching your location, please contact us before you purchase so we can calculate if any additional charges will be due. > CONTACT US FOR RATES TO CANADA. They will depend on postal code. Please get a rate before bidding, in case it is more than expected! The rate could be as low as $600 or as high as $1000, or more. It just depends on your postal code. > All items are in stock in our vendor's warehouse, and will ship within 3 business days! Please allow between 1 and 6 business days within the mainland US, and between 4 and 14 business days shipped to Canada. (Tracking #'s are emailed automatically) Warranty:This item includes a full 5 years warranty on tub structure, and 1 year warranty on electrical. Run the water lines to the area where the bath will be placed. Install the drain lines near to the area where the bath drain will rest. If you are remodeling an older bath and adding the whirlpool tub, make sure the plumbing is adequate to handle the new fixture. Also make sure your home's hot water heater is large enough to provide water for the whirlpool bath. Install the electrical wiring so the tub plug can be hooked up. In addition to the wiring, you need a GFI outlet to protect you from electrical shocks while using the bath. Inspect the whirlpool bathtub before you bring it into the house . Look for any damage to the interior as well as the exterior. Set the whirlpool on a level surface and fill it above the jets with water. Hook it to a temporary GFI electrical connection. Make sure it is operational and that it doesn't leak. Drain the tub and bring it into the house if there are no visible problems. 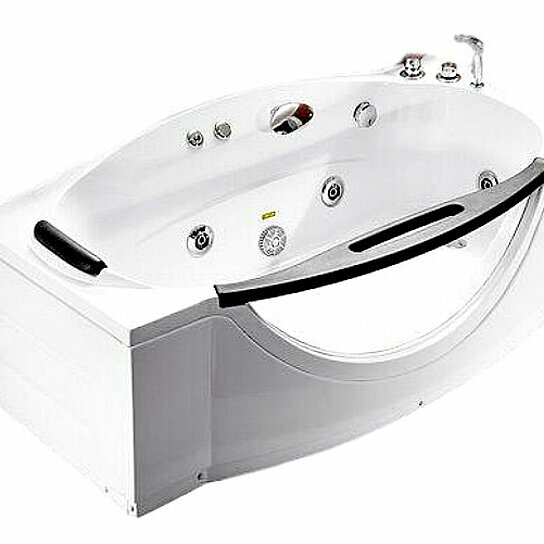 Do not carry the tub by its plumbing fixtures during the whirlpool installation as this can damage them or cause leaks. Hook up the P-trap, the overflow and the waste drain: Lay the tub on its side and attach the drain assembly to the bottom of the tub. Insert the drain into the drain hole inside the tub and tighten the waste line. The rubber seal on the waste line should be slightly compressed but not compressed flat. Next, attach the running water lines to the tub. Check for leaks coming into the tub as well as in the drainage system. Finish wiring the electricity to the whirlpool. Make sure the GFI circuit is complete. Fill the tub with enough water to cover the jets. Turn them on to make sure the whirlpool action is operational. Check again for leaks around any of the joints. Drain the tub.